The 1979 Ford Mustang pace car was one of the highlights of the introduction of the new fox body Mustang. Being chosen as the pace car for the Indy 500 was proof positive, the 1979 Mustang was finally out of the dog house. With the ending of the 1970's gas crisis days, and an unclear future, Ford set out to offer buyers, the best of both performance worlds; a 5.0 liter V8 and and a turbocharged 2.3 liter four cylinder. And the surprising thing was, that little four banger Mustang, was only 1 horsepower shy of it's more than twice the size 8 cylinder brother at 139 hp. Three specially prepared 5 liter V8 versions of the 1979 Mustang pace car, were built up by Jack Roush (creator of the famous Roush Mustangs and Roush Racing). Like the previous year's pace car, the Chevrolet Corvette, a street replica pace car was quickly made available to the interested public. 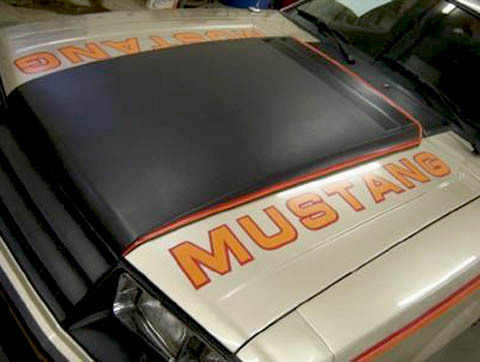 Along with the matching paint treatment and Official Pace Car graphics, the 1979 Ford Mmustang pace car specs were thankfully more than simply a stripe treatment. 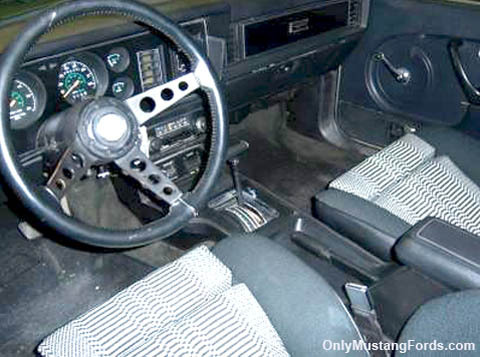 Beyond the obvious fact, that the new 1979 Mustang fox body style was a drastic and dramatic change in styling, compared to the Mustang ll cars, the 1979 Ford Mustang pace car edition, came equipped with a unique, reversed hood scoop, similar to the previous King Cobra unit, as well as a simpler vertical bar grille treatment, lower front air dam and the soon to be expected metric alloy wheels. Mounted into the front fascia, were the addition of two fog lights. At the rear, was the now classic, rear deck lid spoiler and Chrome exhaust outlet. Inside, the 79 pace car provided some very nice Recaro buckets, albeit with the popular at the time, shall we say, "bold print design" inserts in the front and back center sections. The Pace car Mustang dash, included the addition of blackout chrome inserts and an Indy Pace Car plaque. 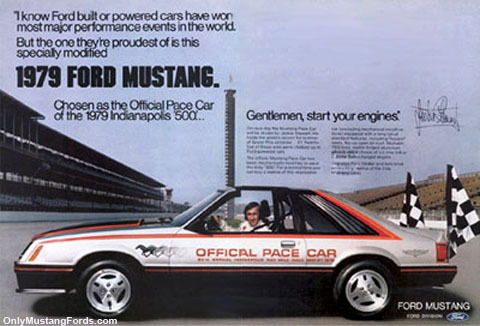 The 1979 Ford Mustang pace car was offered in either the 5.0 Mustang V8 or the 2.3 liter turbo. Thankfully, no base 4 cylinder engines were included. Of the 10,478 pace cars produced, only 20% of these models received the 302 cubic inch V8 engine. The 5.0 liter V8 was still saddled, by the squeeze of emission controls and a 2 barrel carburetor and output was just 140 horsepower. The 2.3 High output turbo option just missed the mark of the V8 at 139 horsepower. Thanks to the lighter weight, the little turbo was in many ways a better car (V8 purists don't hate me). To add to the car's handling abilities, the suspension, was also upgraded with the TRX handling package, including stiffer springs,revalved performance shocks and a heavy duty sway bar. The turbo equipped cars were only available with the 4 speed manual transmission, while V8 pace cars could be had with either the automatic or a four speed transmission.